Epigaea repens. ("Upon the earth.") - Family, Heath. Color, white or pink. Sepals, 5, pointed. Corolla, tubular, with spreading lobes, hairy inside, purest white to deepest pink. 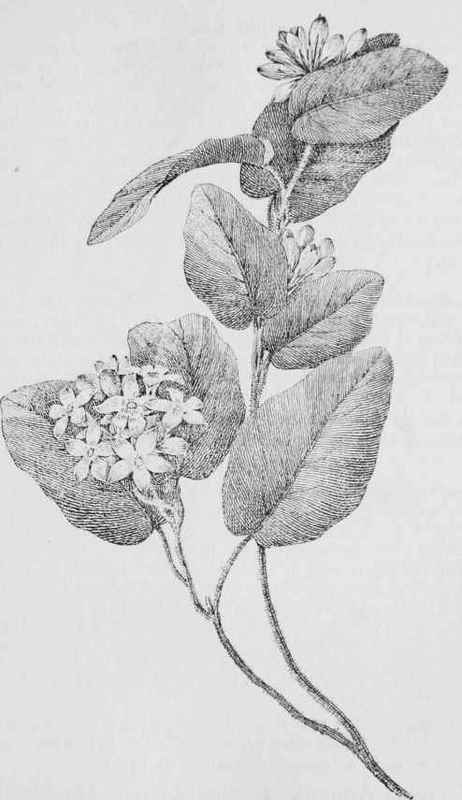 Flowers, in clusters in leaf-axils, hidden under the broad protecting leaves. Stamens, 10. Style, slender, its apex making a ring around the 5 stigmatic lobes. Leaves, round, oval, or heart-shaped, thick, evergreen, on petioles. Whole plant trailing, prostrate, with woody stems covered with rusty hairs. April and May. In open, especially pine woods. A universal favorite and a candidate for honorable mention as our national flower. We love it because it comes so early and because of its delicious fragrance. It delights in pine woods, which it literally carpets in early spring with delicate, modest bloom. You may dig the snow away from shaded corners and find it bright and sweet, looking at you with almost startled eyes. In places it has been plucked to its total extinction. One trembles to see such flowers exposed in great bunches on our city's streets for sale. Vandal armies of Italian and Irish boys tramp through our woods and pull them up by the roots for a few cents' gain. Nor are they the only ones who threaten the extermination of some of our beautiful native plants. City girls and even botanical classes on their excursions gather more flowers than they need, not being careful to leave the root behind. Will not those who love flowers do what they can for their protection? The Mayflower is associated, whether correctly or not, with Plymouth Rock and the landing of the Pilgrims. The legend, as beautifully given by Whittier, is that, after their first dreadful winter, this was the first flower to greet the Pilgrims, and that they took courage when they saw so bright a beauty blooming so bravely in poor soil under wintry snows.